ASSO PE Sinking - 110 yds. 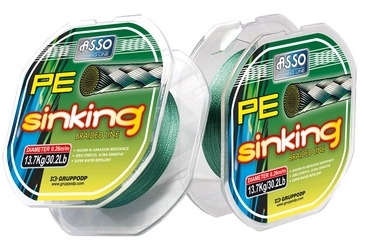 Asso PE Sinking is obtained by mixing PE fiber with polyester fiber, in order to increase the speed of sinking. Its low stretch provides greater sensitivity, and it is characterized by very high breaking strength and the total absence of mechanical memory. It is particularly suitable for trolling and bottom fishing, and is very popular with anglers. ASSO Camouflage - 140 yds. ASSO Micro Finish - 140 yds. ASSO Power Braid - Black - 140 yds.